Is it a smoothie or a shake? 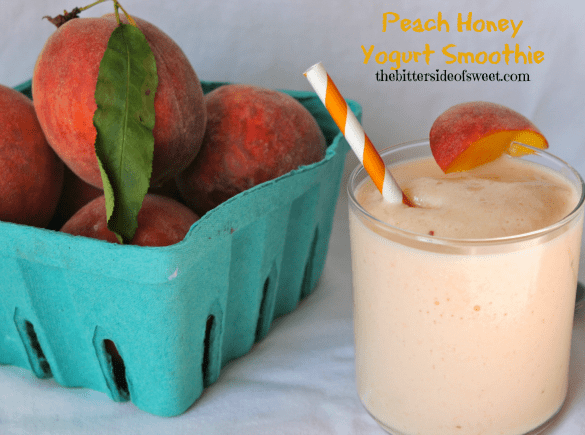 Try this Peach Honey Yogurt Smoothie and you be the judge! I had to look up what was the difference between a smoothie and a shake. A smoothie traditionally is a non dairy drink. A shake consist of some type of dairy. At some point in time this changed and smoothies started to get dairy added to them. I took my favorite dairy, Greek yogurt and added fresh fruit to it to get this smoothie. I wanted to jump up and down when I poured this into a glass and drank it! Well slurped it up with my straw but you know what I mean. 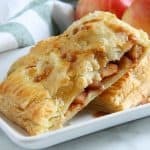 Something so easy and so good for you and taste so great! 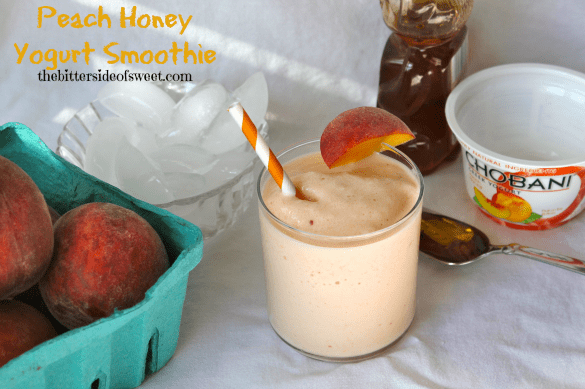 The honey gives the smoothie natural sweetness and the yogurt makes it creamy and thick. Right now I have a lot of fresh fruit in my house because my twinny gave me some fresh strawberries when I saw her and we stopped at the peach stand this weekend! This is the perfect season to start making fresh fruit drinks and the weather has been helping too for we are having lots of sun and heat these last few days! So grab your blender and so ice and ENJOY!! 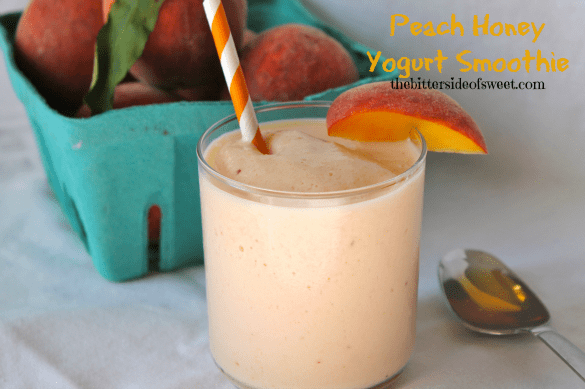 Cool refreshing smoothie with fresh peaches combined with yogurt and honey that makes a healthy combination! Using a blender add ice cubes. Then add yogurt, honey and fresh peaches. Blend till all is completely blended and you have no more chunks of ice in mixture. Pour in glass and ENJOY!! 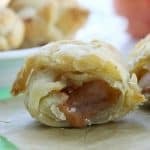 This recipe is linked over at these sites! 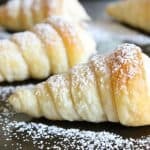 You can’t believe how easy this is to make! And it is so good an healthy!!! 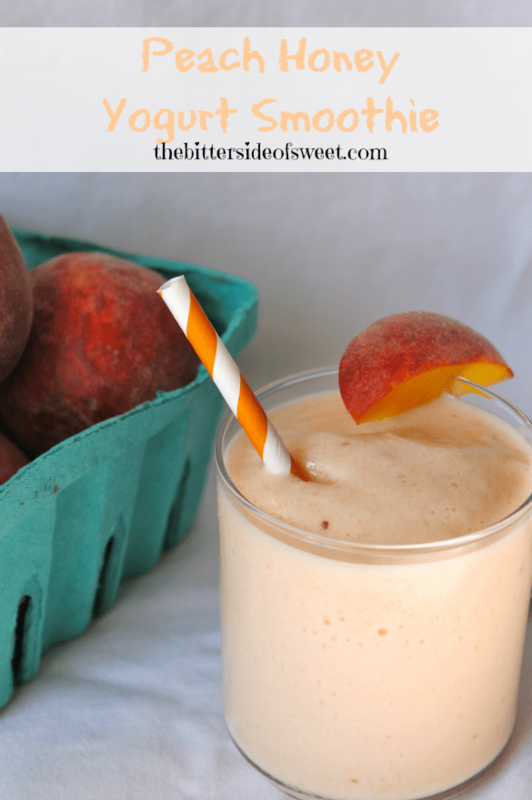 Mmmm , peach smoothie… sounds refreshing! Thanks Tracy! It is very refreshing! Adding this one to my list of smoothies I need to make. I’m obsessed lately! Never tried a peach one before though…love this idea. Thanks Ashley! I am too and my local store has a sale on my favorite Greek yogurt so I am heading over to stock up!!! Thanks for stopping by Lisa, I will check it out! You know, I’ve never even thought about the difference between a smoothie and a shake. Either way, I’m loving this!! I have a smoothie for breakfast most days so will definitely be giving this a try – it sounds absolutely delicious! Thanks so much Chiara! I am currently obsessed with smoothies! Trying to use up all of my fresh fruit! This is exactly the sort of thing that I need to whip up for those mid-morning or mid-afternoon times when the munchies hit. I agree! 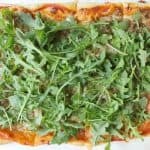 This is great for munchies! Thanks so much for stopping by Dara! Me too!!! Anything that is quick and easy is always welcomed around here! Yum! And I love the little carton of peaches. Adorable! Thanks for sharing at Sweet & Savory Saturdays #15. Thanks. We liked the smoothies a lot!! This looks super delicious! Peach and honey goes really well with yoghurt!! Thanks so much Yvonne! I think they pair well together! Yogurt smoothies are my new favorite kind of smoothie!! Yummy! I just so happen to have a bag of fresh peaches! You should definitely make it!! I saw!!! Thank you so much Jeni!! Looks wonderful – perfect for a summer afternoon! Lavende recently posted…How to grow onions from kitchen scraps – in 3 easy steps! This sounds like the perfect summer smoothie! Yum. I saw this on a smoothie recipe list. I do a similar and in ground flaxseed for some extra nutrition. This looks great. And this is my favourite. Thanks for sharing.